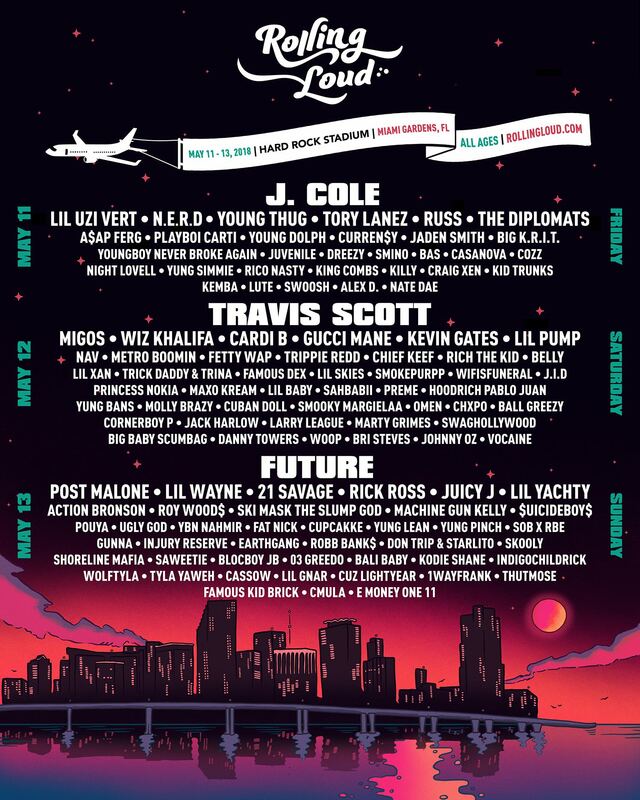 Considered to be the largest hip hop festival in the States, Rolling Loud returns to its hometown of Miami after excursions to Los Angeles San Bernadino and the Bay Area in California. As such, they’ve invited everybody and the kitchen sink to fill the bill. Led by J. Cole, Travis Scott and Future, the likes of N.E.R.D, The Diplomats, Lil Wayne, Rick Ross, Action Bronson, Lute, A$AP Ferg, Jaden Smith, Migos, Gucci Mane, EarthGang, Cardi B and Princess Nokia are among the hundreds of artists tapped to hit the stages. Tickets go on sale February 2nd.